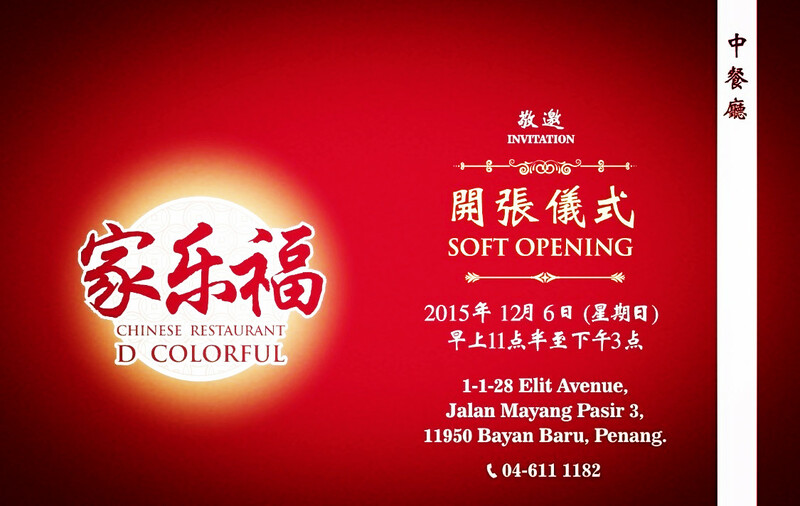 The Most Colorful Chinese Restaurant in Penang was having its Soft Opening on 06 Dec 2016, Sunday , 11am – 3pm at 1-1-28, Elit Avenue, Jalan Mayang Pasir 3, 11950 Bayan Baru, Penang. Delicious Vegetarian and Non-Vegetarian food are served in their daily menu for customers’ choices. The Chef, Mr. Lee is a well known and experienced in charge for all kind of delicious food preparations. Feng Shui Setting by Bazi Matching. All these spent almost 2 months, from ground zero, Company Name selection, Logo Design, Renovation, Kitchen Installation, Furnishing, and finally Soft Opening. “Co” of Colorful is pronounced as “Ka” in Chinese means “家” Family. “Lor” of Colorful is pronounced as “Lor” in Chinese means ” 乐” Happiness. “Ful” of Colorful is pronounced as “Fu” in Chinese means “福” Blessing. Hence, the name is specifically selected as D’ Colorful to mean Happy Family Blessing Restaurant. If you are around in Penang, you may dine in for good food and good feng shui.